It's a looooong plane flight from Georgia to South Africa for Grant, Christina, Papa, and the kids' mystery-writing grandmother Mimi! They're going on a safari! Grant can't wait to see the ìBig Fiveî-lions, elephants, Cape buffalo, rhinos, and leopards. 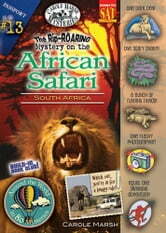 But he and Christina end up seeing much more-and find themselves embroiled in a hot, dusty, safari-style mystery! It all starts when a white lion goes missingÖfollowed by mischievous monkeysÖmysterious messagesÖa snapping snakeÖand ends up with Grant coming fact-to-face with the most fearsome creature of them all! RRROOOAAARRR! 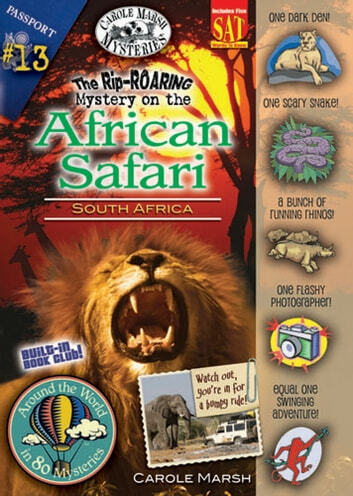 Come along for a wild ride through the sunny, South African savanna! This mystery incorporates history, geography, culture and cliffhanger chapters that keep kids begging for more! Each mystery includes SAT words, educational facts, fun and humor, built-in book club and activities. This book includes a map, inline glossary definitions, and lots more! This Carole Marsh Mystery also has an Accelerated Reader quiz, a Lexile Level, a Fountas & Pinnell guided reading level and Developmental Reading Assessment.